HARTLEY, TEXAS – Long Hunter Shooting Supply is now offering the New Ruger SASS Vaquero with an action job package included in the price. 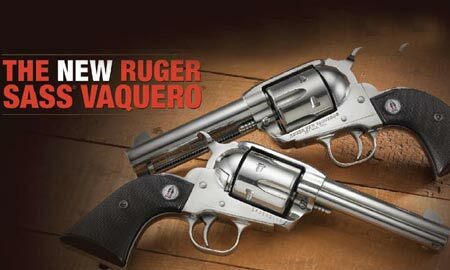 This new model is officially developed with SASS® for cowboy-action shooters, this consecutive serial number, two-gun set boasts a “SASS” prefix and all the features and modifications you want in America’s favorite single-action revolver – the popular Vaquero®. Designed with the competition shooter in mind, these revolvers have a high-polish, stainless steel finish, lower and wider Montado-style hammer, 4-5/8” barrels, wider .140” rear notch sights, and are chambered in .357 Magnum. Opening of Forcing Cone and Polish. Checked Cylinder Gap and Head Space. The 2-gun set retails for $1,300.00 + s/h. The grips are broken and I would very much like to get another set. Thank for a reply and/or suggestion.